The murder of Kenneth Michael Trentadue in 1995 at the hand of prison guards and/or FBI agents in the wake of the Oklahoma City bombing has been burning for years,but has been continually doused with water due in part to someone making headlines this week with the James O’Keefe voter fraud video. O’Keefe,made famous for bringing ACORN to its knees with his groundbreaking undercover videos,asks for and is given our own Eric Holder’s ballot and is told incredulously that he doesn’t need ID. After telling the polling worker that he’d feel more comfortable showing his ID,O’Keefe hilariously leaves the polling place saying he’ll be back “faster than you can say furious,” an obvious joking reference to the Fast and Furious debacle marring the Obama Administration’s Department of Justice. 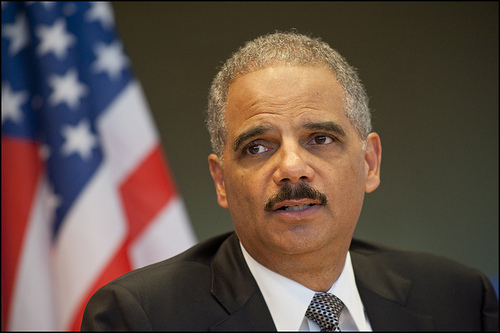 O’Keefe mockingly interposes clips of Holder denying that there is a chance of voter fraud and arguing against voter ID laws with clips of the polling worker handing over a ballot with Eric Holder’s name on it! The death of Trentadue was deemed a “suicide by hanging” by the Government,despite having bruises and gashes on his body from head to toe (including cable tie indentations around his neck.) With the Trentadue family letter to Congress in December of 2008,almost begging Congress to deny Holder a place next to the President as Attorney General,the Trentadue family and many Americans across the United States were hoping Holder would finally be brought to justice. Congress,however,did a “do over” in again not investigating the murder of Trentadue and ignored the family’s pleas. The result was a literal road of bodies in the wake of Eric Holder’s perfidy,with over three hundred Mexican citizens murdered with Fast and Furious weapons and the deaths of Border Patrol agent Brian Terry and DEA agent Jaime Zapata. Kris Zane over at Obama Files tried to resurrect the call for a Trentadue investigation back in January of this year with his extensive article detailing the case,but it was again ignored by Congress. “Will Eric Holder and Kenny’s murderers ever be brought to justice?” the Trentadue family asks over and over. Will America rise up and repudiate Eric Holder and the man who knew full well of his past before appointing him Attorney General,one Barack Hussein Obama? Let us hope so.